WASHINGTON (CNN) -- The United States joined the European Union on Monday in announcing its willingness to resume hundreds of millions of dollars in aid to the new Palestinian government led by President Mahmoud Abbas. The commitment of financial and political support follows last week's gunbattles between rival Palestinian factions that led to Hamas routing Fatah forces in Gaza loyal to Abbas and the crumbling of a Fatah-Hamas unity government. In response, Abbas declared a state of emergency and appointed a new Cabinet of political independents based in the West Bank. U.S. Secretary of State Condoleezza Rice said she spoke by phone with newly appointed Prime Minister Salam Fayyad on Monday. "I told him that the United States would resume full assistance to the Palestinian government and normal government-to-government contacts," Rice said. Rice added that the United States will give up to $86 million to help build the government infrastructure, such as improving roads and providing drinking water. She described Hamas as having an "extremist agenda" and accused the organization of having sought to divide Palestinians. "We reject that," she said. "It is the position of the United States that there is one Palestinian people and there should be one Palestinian state." To ease the suffering of those Palestinians in Gaza, the United States is giving $40 million to the U.N. Relief And Works Agency, she said. "We will not leave 1½ million Palestinians at the mercy of terrorist organizations," Rice said. When asked how aid could be assured for those in Hamas-controlled Gaza, Rice expressed hope that "the people in Gaza would understand that it is important for the international community to be able to respond to the humanitarian conditions there." News of the Western aid came as Israeli Prime Minister Ehud Olmert promised to release to the Abbas-led government hundreds of millions of dollars in previously frozen tax revenue. The EU offered its backing earlier Monday, resuming its aid that, like Washington, had been cut off after Hamas victories in 2006 Palestinian elections. Hamas, an Islamic fundamentalist group, refused Western demands that it renounce terrorism and its call for the destruction of Israel. Europe and the United States are the largest two donors to the Palestinian territories. Before Hamas took control of the government last year, the EU provided more than $600 million in aid -- about half of it directly funding the Palestinian Authority. The United States provided more than $400 million to the Palestinian Authority. After swearing in a new Cabinet on Sunday, Abbas on Monday dissolved the national security council, according to a Palestinian political source. Hamas leader Ismail Haniya, who had served as Palestinian prime minister until Abbas dismissed him last Thursday, held the position of deputy chairman of the council. It is unclear whether a new council will be formed in its place. Bush also told Abbas he was "open to the idea" of restarting Mideast peace talks to stabilize the situation and will do anything to "move the peace process forward," Johndroe said. Bush told Abbas that before he makes any firm commitments, he wants to "raise all of those issues" with Olmert during their meeting Tuesday. Human rights groups have urged the Israeli government to reopen its border crossings with Gaza to allow food and medical relief supplies. Israel agreed on Monday temporarily to open the Erez border crossing for a delivery of Red Cross medical supplies to Gaza, an Israel Defense Forces spokeswoman said. While Hamas has gained control of Gaza, Fatah is trying to consolidate its power in the West Bank and extend it into Gaza. Fatah official Saeb Erakat denied that there are two Palestinian governments, but he made it clear that the newly appointed Cabinet's first priority would be to prevent the spread of the "chaos and lawlessness" in Gaza. "We will not allow ... the catastrophe that's happened in Gaza to reach the West Bank, that's No. 1," Erakat told CNN's "Late Edition With Wolf Blitzer." 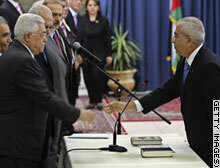 Palestinian President Mahmoud Abbas, left, swears in Salam Fayyad as prime minister.